While you have a thing it can be taken from you... but when you give it, you have given it. No robber can take it from you. It is yours then for ever when you have given it. It will be yours always. That is to give. today's saturday safari snap features dilly. dilly is named after dilly dedalus, stephen's generous little sister in ulysses. although still a young cat, dilly been on quite an odyssey of her own. dilly initially lived with mj. last summer mj had a terrible fall resulting with mj having to spend a couple months in a rehabilitation center while her bones knitted back together. at this time dilly went off to boston to live with j, one of mj's sons. however, dilly and j's cat did not get along as cats that do not get along do. finally after a few months of unrelenting strife and escalating conflict between the two cats, j was forced to ask mj to find a new home for dilly. mj would have loved to have welcomed dilly back to live with her, however, mj was on an odyssey of her own as she was moving from her house of forty years into an apartment. unfortunately management of the apartment prohibited animals. fortunately for dilly and for mj, friend joan, who not too long ago lost her own much loved cat to infirmity and old age, volunteered to take dilly in. dilly now lives with joan and her family where she is much loved and doted on. curtis mayfield first recorded gypsy woman in 1963 on the debut album of the impressions, a soul group he was with at the time. this vid was recorded much later. a talented multi-instrumentalist with a voice like no other, curtis was a pioneer of funk music. mayfield died in december of 1999, several months prior to his death he was inducted into the rock and roll hall of fame. Dilly is such a pretty cat. I'm glad she ended up in a good home. Here's wishing dilly and her owner years of happiness together. Lovely everything, as usual, petite souris. I haven't heard or thought of this song in so long. Thanks for the reminder and Dilly is such a fortunate little lady. Dilly has had quite the journey. I'm glad Dilly has finally found domestic bliss! k - thanks for the link. jerry looks and sounds great!! 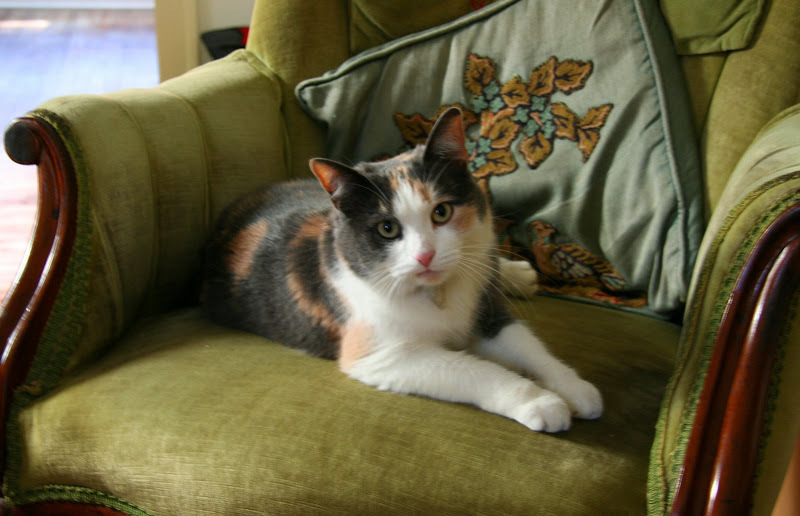 Dilly looks like a real charmer; glad she has found her way to a new home!